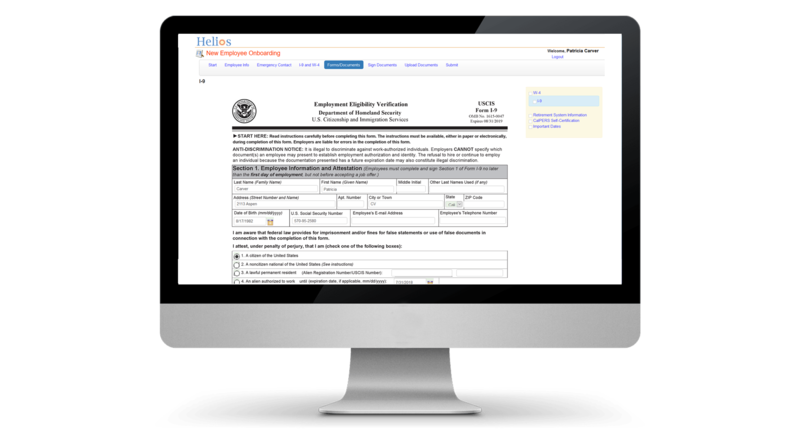 Helios helps new hires to complete forms and enter information online easily. New hires can read and e-sign district forms and documents, including manuals and policies. The information collected includes personal information, W-4, I-9, dependents, benefits, as well as documents like resumes and transcripts. Eliminate your paper packets and have everything online, allowing new hires to complete onboarding anywhere from a web browser. 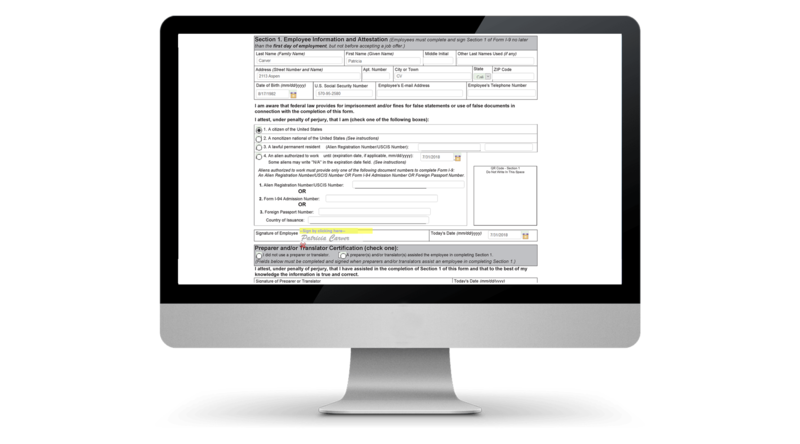 New employees can complete the paperwork online at their own pace and required fields ensure they complete all the necessary information before submitting. On average, it takes from 1 to 2 hours for HR staff to work with a single new hire on their new hire paperwork. With Helios, this time can be cut by 90%. 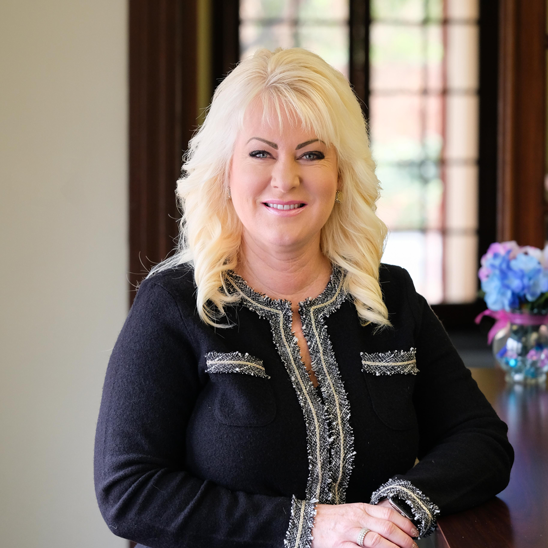 Moreover, when your new hire does walk into the office, the conversation can be much more productive and shorter focusing on their questions and truly giving them a warm welcome instead of a bunch of paperwork. It also saves your staff hours of data entry work and your office the paperwork cost. Like many other districts and charters, onboarding with Helios can be a huge benefit for you and your new hires. Being forward-thinking, the ability to have an online onboarding process like Helios puts us at the forefront. It also helps us recruit better! With Helios, a new hire has to spend only 10 minutes with us instead of almost two hours. Staff time is huge, so I would highly recommend Helios to any district. What’s even better is Helios can help you build your own forms, policies, and documents into Helios complete with e-signature capabilities. With Helios, you can customize your new hire packets and create multiple packets for various groups of employees such as Certificated, Classified, Coaches, Substitutes, Bus Drivers, etc. There is no limit on the number of forms or packets you can build in Helios and there is no extra cost for additional packets and forms. You can also customize welcome emails and messages for new hires. 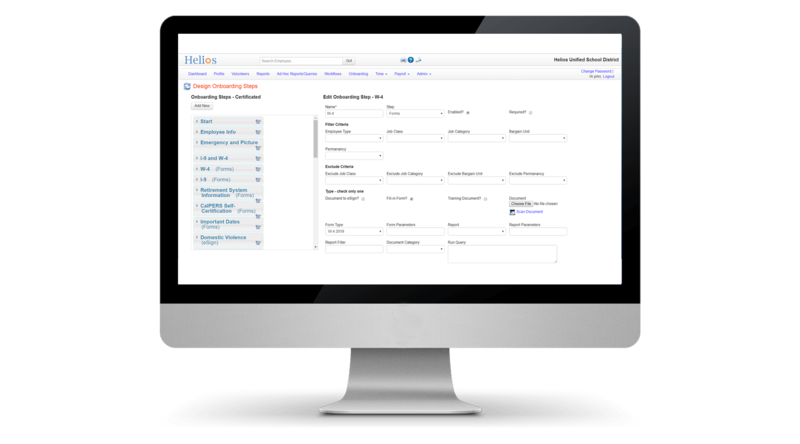 Helios offers built-in workflow capability to route the onboarding through various approvers such as school sites, HR, accounting, payroll, IT, or others. Email notifications are sent at each step. New hires get a welcome email that you can customize. Each approver in the process gets an email notification to review and approve the new hire’s information. Finally, payroll can receive the payroll forms after completion and other departments such as IT and HR can be notified. Unlike many other providers, with Helios, it does not just stop there after completion. All these new hire data goes into the HR portal of Helios where you can do reporting, manage employee data and electronic file, and do automated reminders. 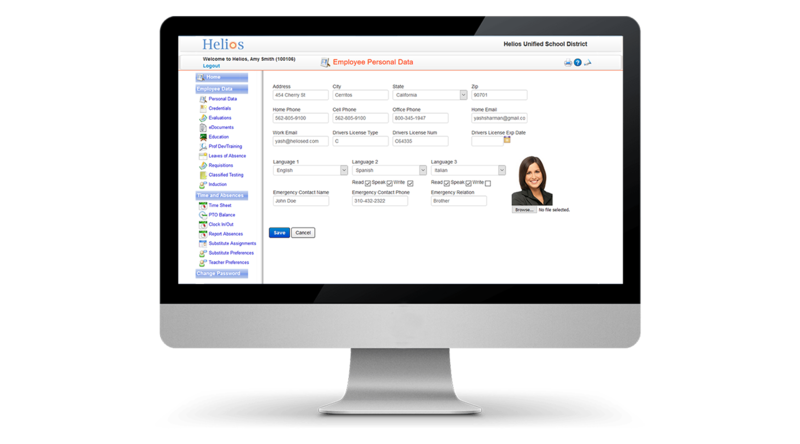 Helios can interface with payroll or other HRIS systems for the new hire data. This integration reduces the multiple data entry, saving time and money while reducing errors.